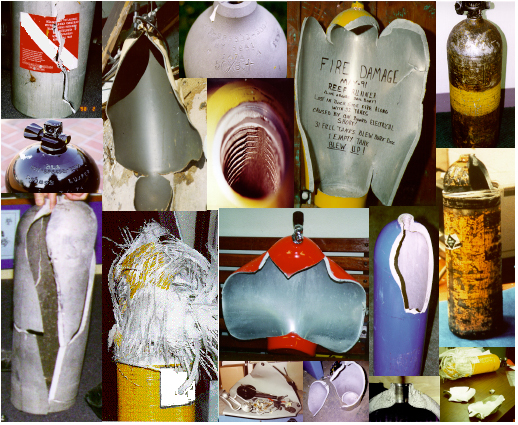 Several of over 100 documented cylinder explosive failures! Explosive failures each year demonstrate the need for technical cylinder inspector training. In 1999 there were eleven cylinder failures, in 1998 there were ten cylinder failures. Each of these catastrophic failures was preventable by a quality visual inspection with proper formal training at our VCI Workshop. PSI, Inc. is the only full service corporation of its kind in the world. We provide fully supported formal/hands-on training for visual inspectors of SCUBA and SCBA cylinders and carry a full line of specialized inspection tools. Our corporation is a leader with informational support to the compressed gas industry. DOT, OSHA, CGA members and manufacturers attend and refer persons to our training program. Compressor manufacturers Bauer and Compair/Mako as well as hydro retest equipment manufacturers, Galiso, Inc. and Hydro Test Products, Inc. refer persons to PSI for tools, information and training. Further, the Federal National Oceanic and Atmospheric Administration (NOAA) requires its SCUBA cylinders to be inspected by a PSI trained inspector. 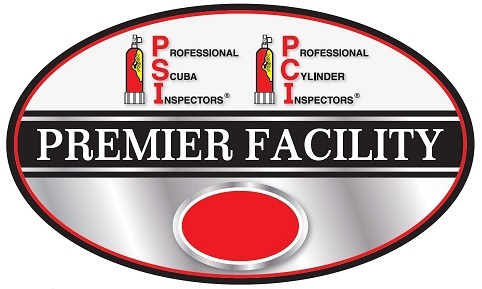 Other government agencies, including the U.S. Secret Service and U.S. Navy have PSI Inc. affiliated inspectors using our training format to provide in-house visual cylinder inspector training. PSI publishes the fifth edition of the textbook, "Inspecting Cylinders" as well as the support document entitled "Hazmat Training Instructor Guide" which is specifically tailored to meet DOT requirements for Hazmat Training of Cylinder Handlers and Fill Station Operators in the compressed air service. The PSI, Inc Visual Inspector Training Course was developed and introduced to the diving community by William High. With an extensive background in science and diving, his numerous published articles on high pressure cylinder inspection have set the "Standard" for today's Dive Centers, State and Federal agencies. We can conduct the course in Reno or at your dive center. Each attendee will learn about cylinders, inspection techniques, handling and filling. You will perform several inspections of cylinders using the latest in specialized equipment and techniques. Your course includes all training materials, certification and detailed reference guides of your use. To schedule your PSI Course give us a call or email keith@sierradive.com . We'll set up the course or bring it to your location. Learn to "make a difference, one inspection at a time."